Family of the Month – The Davvala Family – Sponsored! Kameswari has been sponsored! Thank you so much! There are many other families in need – to learn about them, please click here. Kameswari is a 36 year old mother who would love to improve the lot of her family by developing a business selling rice. Her story is a very sad one. Both she and her husband, Apparao, suffer from AIDS and T.B. and these diseases are impacting on the their lives and those of their teenage children dramatically. One of her children, Bharathi, the eldest daughter, dropped her studies at the age of 15 and went to work in a nearby embroidery stitching company for meager earnings. She has been the main bread winner of the family for the past two years. Her brother, Anil Kumar, continues his studies but often skips class and to pick up odd jobs to help meet the daily needs of the family. 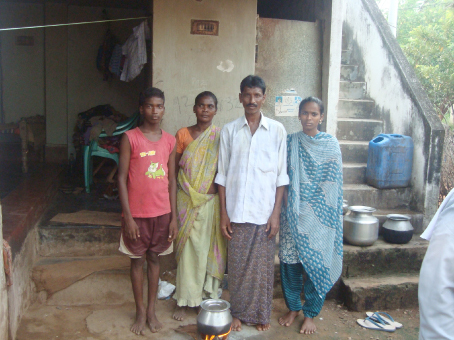 You can read more about this family and sponsor them at this link. Thank you for your help!